MBA can be quite a costly affair these days with all the huge B-School fees, loan-repayment and the pressure to earn a fat pay-check. In these situations, who would want to shell out a fortune in CAT / MBA preparation. The good news is, now you can prepare with the best CAT trainers without having to spend big. Let your past achievements be the certificate for your worth. TestFunda presents a unique scheme, where you can get all courses, at exclusive discounts based on your past scores or achievements. So what are you waiting for? Choose your scheme and enroll with us today! 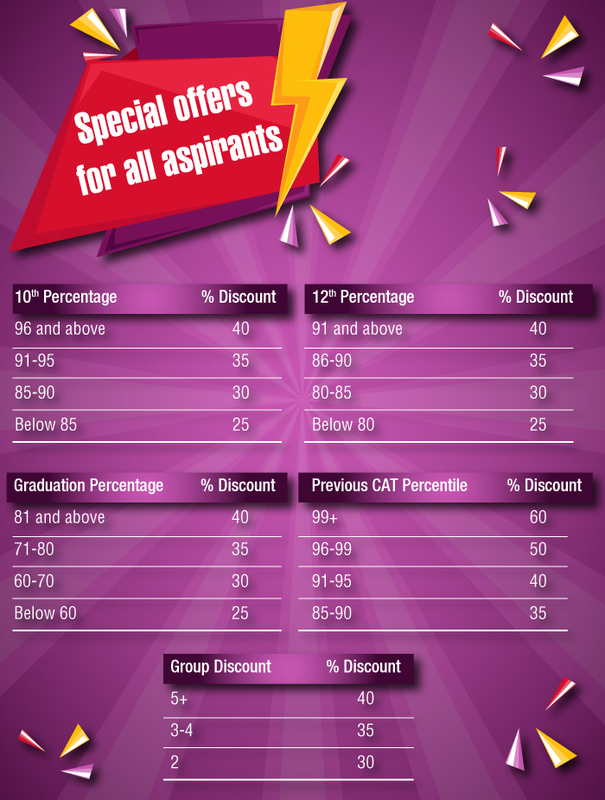 If you fit into any of the discount brackets in the above table, mail, chat or whatsapp us a screenshot / image of your academic certificate as proof of percentage/percentile achieved along with the course you wish to purchase and your TestFunda Username. We will send you a unique code which you can use to complete the purchase at a discounted price. You can also give us a call on 9930005544 / 9820569870 and our counsellors will help you out. You can request for a call-back on our e-mail id or Whatsapp number or drop an SMS and our counsellors will be happy to help you out.